It was mid-summer, less than three months before Canada legalized recreational marijuana, and Vic Neufeld had a problem. The chief executive officer of Aphria Inc. had just hired 50 people to work in the pot producer’s greenhouse in Leamington, Ontario and by the end of the first week all but eight had quit. “Those are really hot, humid months and working in a greenhouse, as much cooling and airflow as we can provide, is still pretty darn hot in July and August,” Neufeld said in a phone interview. A lack of qualified local labor forced Aphria to dispose of almost 14,000 cannabis plants in the quarter ended Aug. 31 after they weren’t harvested in time, costing it nearly C$1 million ($750,000). Since then, the company has doubled the staff at its Aphria One greenhouse thanks in part to Canada’s Seasonal Agriculture Worker Program, which has allowed it to hire about 50 temporary workers from the Caribbean and Guatemala with plans to bring in up to 100 more. Aphria’s experience underscores the swelling demand for labor in Canada’s five-year-old cannabis sector, where openings have tripled in the past year to 34 out of every 10,000 job postings, according to employment search engine Indeed.com. Canada’s licensed producers employed about 2,400 workers at the end of 2017, according to Statistics Canada, and BMO Capital Markets estimated that industry employment was around 3,500 people when legalization took effect in mid-October. 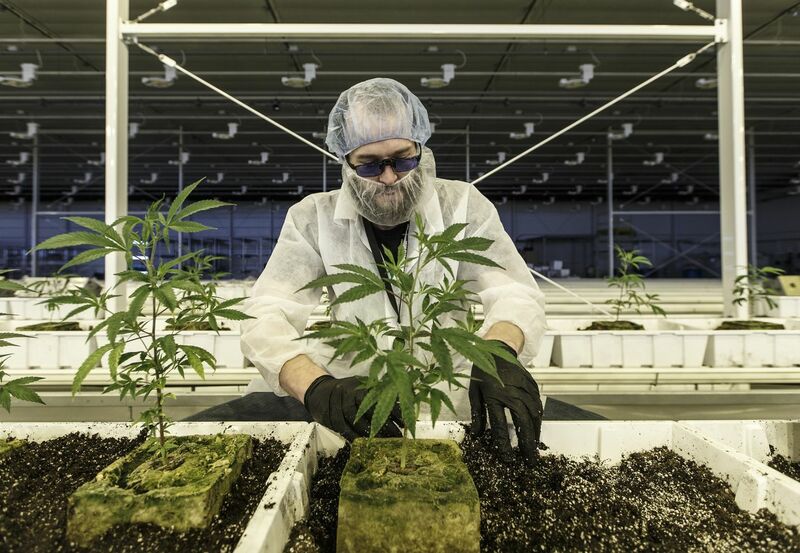 Between them, eight of Canada’s largest cannabis companies are now actively recruiting for approximately 1,700 positions, according to data compiled by Bloomberg. Many companies say they expect that number to grow as they expand production facilities after Canada legalized recreational marijuana in October. There’s been a spike in postings for jobs at cannabis growers and retailers. And next year will see even more demand for labor as Canada expands the number of legal cannabis products to include edibles and concentrates, said Alison McMahon, founder and CEO of Cannabis At Work, a recruitment and training site. “We’re going to see a lot of R&D positions and a lot of science-based positions around extraction and formulations,” McMahon said, estimating that the industry could create around 125,000 jobs in the first year after legalization. Increasing automation will also likely accelerate the shift toward more high-tech jobs in the industry away from more manual jobs. That would follow the pattern of traditional sectors such as the auto industry, where blue-collar manufacturing jobs have been disappearing as companies ramp up spending on research and engineering. Canopy Growth Corp., Canada’s largest licensed producer by market value, needs to fill about 1,200 positions. Recent postings on the company’s recruitment site range from a “destruction lead hand” in Langley, British Columbia to a “soft gel encapsulation manager” in Smiths Falls, Ontario. With operations in 12 countries, Canopy is also recruiting for a few international jobs, including a regional manager for natural health products in Frankfurt and a manager of medical affairs in Cape Town. Most of Canopy’s hiring is happening in Canada however, as the country is the global center of the legal cannabis industry, said CEO Bruce Linton. “It’s kind of like a burden for the globe but it’s being borne in Canada because it has the most medical patients and it’s the best place to hire the people to do the research,” Linton said in an interview. Aurora Cannabis Inc. has grown to 1,700 employees worldwide from 35 when Chief Corporate Officer Cam Battley joined the company in March 2016, Battley said in an interview. The Edmonton, Alberta-based company currently has about 140 openings and is bringing 60 new employees on board each month. There’s plenty of interested candidates, with Aurora getting between 200 to thousands of applications for each posting. Competition for workers is fierce, with Canada’s jobless rate at a four-decades low of 5.8 percent. The latter industry, largely based in Aurora’s home province of Alberta, is suffering from the slump in Canadian crude prices, which fell to a record low in November. “There’s no question that we’ve been one of the bright lights in the Alberta economy,” Battley said.